First Class Scout Brandon Kelly of Troop A125 fires a pistol at The Barrels. 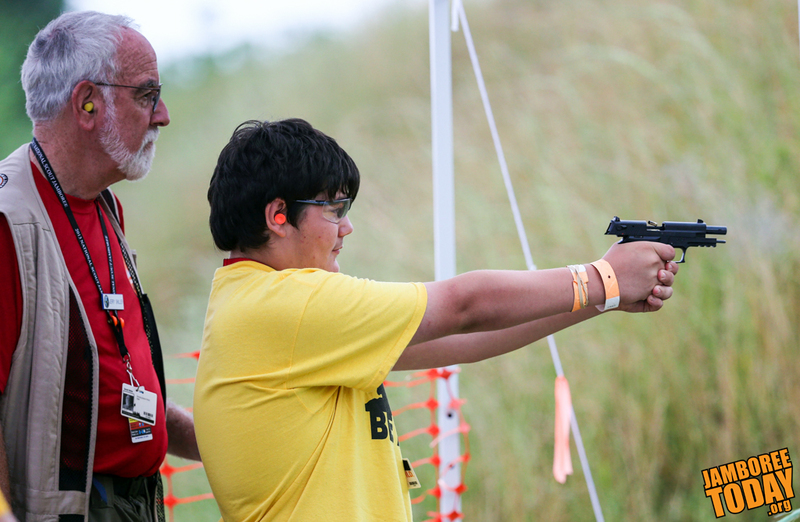 Pistols are a new addition to shooting sports at the National Scout Jamboree. BSA photo by Al Drago. From pistols to low-caliber rifles and shotguns, there's something for everyone at the Barrels. Although any individual Scout and Venturer might not have fired all of the firearms available at the Summit, many participants are completely satisfied with their experience. "It was worth it. I did the .22 shoot and that made it worth it," says Dylan Smay "You got unlimited time to shoot. The pistol shoot looked excellent. The shotguns looked cool, but I'm not a shotgun person. It looked really cool and fun, but I couldn't bring myself to try it." The Barrels might have been a long walk for many Scouts, but most agree that the walk wass a small price to pay for such a great experience. Contributor Nick Hessler is from Troop 21 in Mason, Ohio. He is very involved in the Order of the Arrow serving as the 2013 C6B section secretary and the managing editor for the National OA Communications Team. He hopes to pursue a career in journalism.